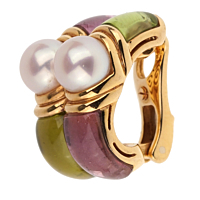 A unique pair of amethyst peridot gold hoop Bulgari earrings. Featuring carved amethyst, peridot, and pearls in 18k yellow gold, these earrings are a chic and gorgeous addition to any jewelry collection. 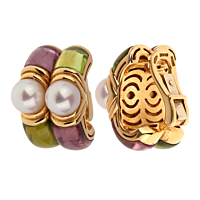 These clip-on earrings feature two pearls on each earring and a fun, colorful design, set in glamorous yellow gold.